1) March 1995 MK International was founded. 2) May 2000 MK International was incorporated. 3) May 2000 Entered into an agreement with Manexpo Cia. Ltd. to be the sole Corozo sales agency in Asia. 4) April 2001 Started exporting to China. 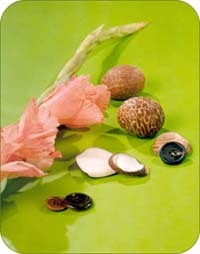 5) May 2001 Started selling Buffalo Horn Buttons. The quality of raw materials determines the quality of buttons made of natural Corozo to a great extent. As the quality of raw materials vary a great deal depending on where and when they are produced. We entered into an agreement with Manexpo Cia Ltd. of Ecuador to be the sole sales agency in Asia. Manexpo Cia Ltd. is the world's number 1 producer, and supplies 70% of the demand of Germany and Italy, the high-quality markets of the world. So we are getting exclusive and stable supplies of the best-quality raw materials. 3) Inspection To maintain the highest quality level, at MK International, 6 skilled employees not only inspect the quality of raw materials, but also perform quality inspections at each production process from finishing through dyeing to post-processing.